The 36g bow was somewhat neglected, as I’d planned to get rid of it for a while now. 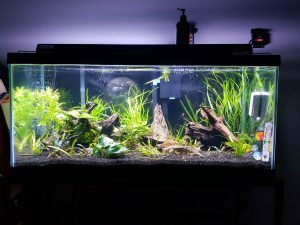 The 20g on the other hand, I really liked, and I used that tank’s design as a base to build on. The result was immediate and pleasing, although I was slightly concerned about the fish getting along. After all, I combined two completely separately tanks, with fish I’d had no intentions of ever keeping together. The other consideration to make was the equipment. I decided, even though I had no real issues with it at present, to ditch the eheim 2217. I’ve always been a fan of eheim canisters, but I’ve also been a fan of neglecting them, and letting them go too long between cleanings. 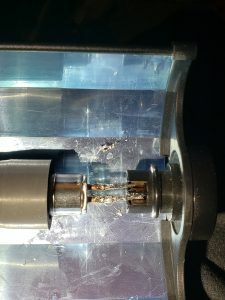 I am sure that I am not the only one – I believe canister filters in general, promote bad husbandry, as it means every time you want to clean your filter media, you must crack open a water-tight seal. Where as – a hang on back, it’s an open system, much like a sump, and so there is no seal to break in order to swap media. I did end up adding a third bag of ecocomplete black, but I’m pretty happy with things now. I may eventually tie this system into my upstairs apex, and retire the inkbird for other purposes, but in the meantime, this tank has been doing pretty well with this setup, and I’m quite pleased with the results so far. I do still have the eheim as an option, but I think I will likely retire all my canisters from use, for now.